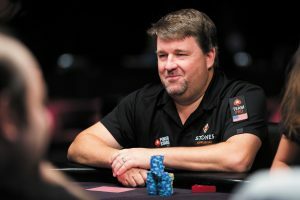 UNCASVILLE, CT (September 19, 2018) – Pokerstars Ambassador Chris Moneymaker will be among hundreds of hopefuls keen to make their mark at Mohegan Sun’s Poker Room October 4th – 7th when the Moneymaker PSPC Tour makes its sixth stop of the series. Philadelphia Visitor Wins Over One Million On Four Card Poker Jackpot At Mohegan Sun! UNCASVILLE, CT (February 14, 2018) – Luis Nieves of Philadelphia, PA drove home feeling very lucky this past Sunday after playing just $5.00 and hitting the four card poker jackpot totaling $1,018,000. Oakdale, CT Man Wins Over 2 Million On Progressive Pai Gow Poker Jackpot! UNCASVILLE, CT (December 8, 2015) – With the total coming in at $2,075,841, Lauren Renaldi of Oakdale, CT, struck it big on Saturday, December 5th, hitting the Pai Gow Poker Progressive Jackpot! Located in Casino of the Earth, this table game progressive jackpot was at the highest total for any of its kind in New England at the time it was won. Congratulations to Lauren! WHAT: The DeepStacks Poker Tour returns to Mohegan Sun for the 2013 DeepStacks World Championship, a week-long event featuring a $650,000 series guarantee that culminates in a televised final table on Monday, November 25th. 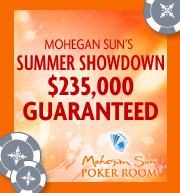 WHAT: Mohegan Sun’s Summer Showdown offers poker enthusiasts five days of tournaments with a guaranteed prize pool of $235,000. WHAT: Professional poker player, Beth Shak takes part in an exclusive signing event in Mohegan Sun’s Poker Room on Saturday, October 22nd. Poker players have a million reasons to play in July with Mohegan Sun’s Summer Showdown Poker Tournament featuring a $1 million guaranteed prize pool. This ten-day event, which features the largest confirmed poker prize pool in Mohegan Sun history, will conclude with a three-day $700,000 Guaranteed No-Limit Hold’ Em Main Event on August 1st.